Bethesda Green celebrates 5 years of promoting sustainable living with a fabulous Gala Thursday, October 3, at the historic Bethesda Blues & Jazz Supper Club. This event gathers people from the DC metro area who share the vision of a more green and sustainable community. Highlights of the evening include honoring 2013 Bethesda Magazine Green Award winners and recognizing businesses, organizations, communities and individuals who are providing green services or promoting and living a green lifestyle. Click here for more details about the Gala. Early Bird tickets (20% discount) available through Friday, Sept. 13. Do you know a Green Champion? Nominations for the 4th annual Bethesda Magazine Green Awards, conducted in partnership with Bethesda Green, are now being accepted for businesses, organizations, communities and individuals who are providing green services or promoting and living a green lifestyle. Click HERE for details and entry form. Submission deadline is June 28; self-nominations ok. Winners will be profiled in the November/December 2013 issue of Bethesda Magazine and honored at the Bethesda Green Gala, October 3. The 3rd annual Bethesda Green Gala, Thursday, October 11, 2012, hosted at 2000 Tower Oaks Boulevard – a “green” building that has earned LEED Platinum certification – will offer an evening of inspiration, celebration and recognition of local green champions. 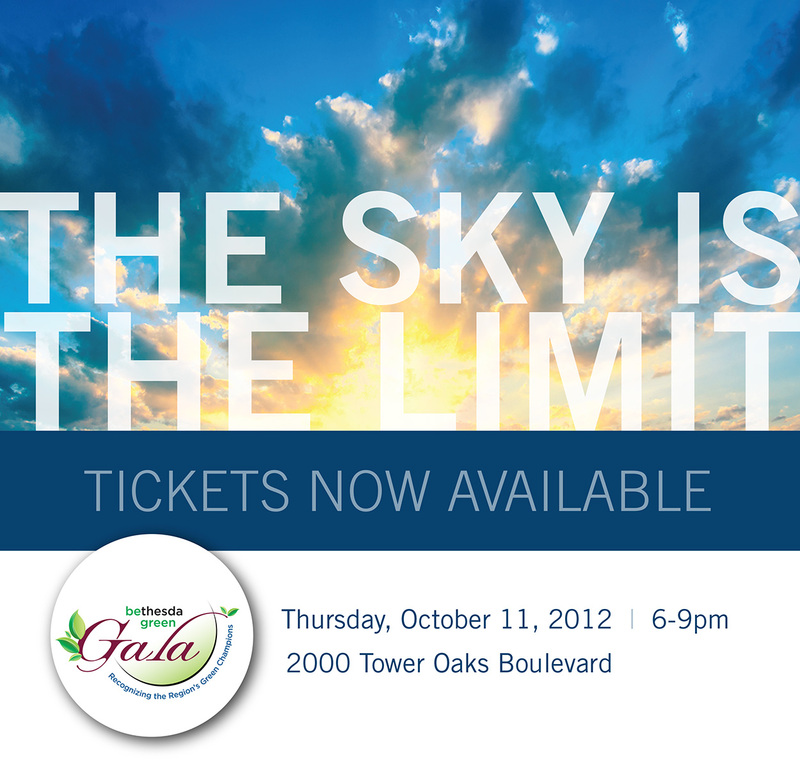 In addition to recognizing the 2012 Bethesda Magazine Green Award Winners, highlights of the evening with the theme of The Sky Is the Limit will include displays that imagine what a green community can be. The Gala will offer fare from local purveyors, an open bar with local beer and wine, a silent auction featuring sustainable gifts and services, and more. More information about the Gala can be found here, or you may purchase tickets directly at the link below. With a June 29 deadline approaching, now is the time to enter the 3rd Annual Green Awards, presented by Bethesda Magazine and Bethesda Green. Nominations are being accepted here for the 2012 Green Awards. Winners will be profiled in the November/December issue of Bethesda Magazine and recognized at the Bethesda Green Gala on October 11, 2012. The Green Awards recognize businesses, non-profits, communities and individuals that are leading the local fight to protect the environment. Click here to read about last year’s winners. Local apples were plentiful at the farmer’s markets the last couple of weekends. That should be the case for at least a couple more to come. If you love apples and like to roll up your sleeves and get your hands dirty, some orchards in Montgomery County welcome you to pick your own. The wet weather has closed some of the fields to visitors on some days, so be sure to call ahead. You can also find out what varieties are available on any given day. Pick-your-own orchards include Homestead Farm in Poolesville, Lewis Orchards in Dickerson, Rock Hill Orchard in Mt. Airy, and Butler’s Orchard in Germantown. If you know of others, feel free to leave a comment at the end of this news and events post. The 2011 Solar Decathlon kicked off this weekend near the Roosevelt Memorial, at the National Mall. Once again, as in 2002, 2005 and 2007, UMCP was one of 20 universities whose students competed successfully for the right to build and display their solar home design on the mall. Their entry, called WaterShed, is a solar powered home that also conserves, filters and reuses water. If you plan to visit the free exhibits, workshops and events, you can preview WaterShed and read about the students and mentors who made it happen at the UMCP solar team’s Website. For information about all the solar homes and daily workshops, visit the Department of Energy’s Solar Decathlon Website. The event runs through Sunday, October 2nd. The University of Maryland Energy Research Center (UMERC) that opened Monday, September 26 in College Park will be focused on alternative energy generation and storage. The center’s mission will be to develop energy efficient and environmentally sustainable technologies and practices and also educate the public about energy issues. The mission also includes improving the nation’s energy security by developing local and sustainable energy resources and policies that have a positive environmental impact. The center is part of the university’s A. James Clark School of Engineering and includes faculty from the engineering school and other colleges. Katie Griffith wrote in the Potomac Patch on 9/22 that, “A battalion of community members decked out in green showed up at Wednesday night’s [9/21] town hall meeting with Montgomery County Executive Isiah Leggett (D) to support Nick’s Organic Farm at the Brickyard Road site.” The article says the farm issue took center stage for at least 20 minutes of the one-hour meeting. Nick’s supporters apparently were unsuccessful in swaying Leggett, who maintained his support for the deal made between Montgomery County Public Schools and the county government to turn the farm into soccer fields. U.S. Dep’t. of Energy Solar Decathlon, Friday, September 23 – Sunday, October 2, West Potomac Park, National Mall, Washington, D.C. Competing collegiate teams (including University of Maryland) exhibit cost-effective, energy-efficient, and attractive solar-powered houses designed, built and operated by the students. This free event includes tours of the solar homes, consumer workshops and award ceremonies for the winning teams. BG101, Thursday, September 29, 4:00 – 5:30 pm, at Bethesda Green. Join us for an orientation about Bethesda Green, our history, upcoming events and volunteer opportunities. Taste of Bethesda, Saturday, October 1, 11:00 am – 4:00 pm, at Bethesda’s Woodmont Triangle. More than 55 restaurants and four stages of entertainment and a kid’s corner for face painting and arts & crafts. Information here. Tour of Solar Homes, Saturday and Sunday, October 1 – 2, 11:00 am – 5:00 pm. The 21st annual tour includes more than 50 homes in the greater DC area and highlights a variety of design, technology and sustainable living concepts. Tour Guides are available for $5 at My Organic Market (Mom’s) or online. 2011 Bethesda Green Gala, Wednesday, October 5, 6:00 – 10:00 pm, Round House Theatre. Come meet local folks from the businesses, non-profits, community organizations and individuals whose innovations, practices and lifestyles promote environmental sustainability — winners and runner-ups of the 2011 Bethesda Magazine Green Awards, who will be announced and recognized for their inspiring work in the environmental community. This promises to be an evening of sharing and connecting as a community where we celebrate our greener future. More information. Green Home Expo, Saturday October 22, 10:00 am – 4:00 pm at Bethesda Green. Learn easy ways to green your home and save money. Presentations will cover conservation, efficiency and renewable energy. In addition to industry vendors, meet representatives from nonprofits and Montgomery County government. More information coming soon. Food Day, Monday, October 24, 2011, 7:00 pm, at the Church in Bethesda, 5033 Wilson Lane, Bethesda. You are invited to a local screening of the documentary film “Ingredients” co-sponsored by Church in Bethesda, Bethesda Presbyterian and Graceful Growing Together. The evening will also include short presentations by community members about healthy food, sustainable farms and related topics. Please RSVP if you plan on attending! Redskins 22 – Arizona 21. Solar Power Wins the Day! If you parked your car in the Platinum A1 parking lot at FedEx Field on Sunday (9/18), it would have been one of 850 vehicles parked in the shade. That shade was provided by 8,000 new solar panels built over the lot by NRG Energy, Inc. The largest solar power installation in the DC metropolitan area will provide 20% of the stadium’s electricity needs on game days and 100% on non-game days. Sunday’s game was dubbed “The Solar Bowl.” Go Redskins! University of Maryland Eastern Shore announced on September 13 the formation of a renewable energy development company, Eastern Shore Energy, LLC. The new company will create renewable energy projects at multiple sites on the lower Eastern Shore. The company’s goal is to develop systems capable of generating 100 to 150 megawatts from wind, solar and biomass projects. The regional initiative is the result of a partnership between the Maryland Hawk Corporation, (a non-profit affiliate of the university) and National Renewable Solutions, LLC of Minneapolis, MN, an affiliate of National Wind, LLC. More information here. Mayor Vincent Gray has launched a new Website called “Sustainable DC: Start in September”, and asks residents to, “Help make the District the greenest, healthiest, most livable city in the country.” The Website includes a discussion guide and invites users to share their feedback. It also includes a calendar of related discussions and events hosted by groups throughout the city. Bethesda Central Farm Market Ranked Among Best in U.S.
Congratulations to the Bethesda Central Farm Market. In the “America’s Favorite Farmers Markets” contest, the local farm market was ranked 2nd best in the state of Maryland among markets of all sizes and 10th in the nation among medium sized farmers markets. The contest was put on by America’s Farmland Trust. Voting was online and open to all. Savor Local Flavor: Four Course Dinner and Discussion with Chef Tony, Monday, September 19, 7:00 – 10:00 pm. Chef Tony’s, 4926 St. Elmo Avenue, Bethesda, MD 20814. This is the third in the series On the Farm; Around the Table, connecting farmers, food and community in three meals. Chef Tony specializes in seafood and plans his menu based on what’s at its peak of ripeness that very day. During a fabulous four-course dinner, Chef Tony will talk about sourcing and cooking with seasonal and local ingredients. More information here. Sustainable Office Seminar, Tuesday, September 20, 8:00-11:00 am, at Bethesda Green. Five sustainable office specialists offer concepts and practical tips to help people thrive in your office and make your company a “Best Place to Work.” Register here. For more information contact: sustainable.office.alliance@gmail.com. Community Service Week Info Session, Thursday, September 22, 12:00 – 1:00 pm, at Bethesda Green. Learn more about Community Service Week and how your group can get involved as well as tips on planning a project. For more information about Community Service Week, visit www.montgomeryserves.org. Forest Glen Park Stroll, Saturday September 24, 2:00 – 4:00. A Conservation Montgomery event. Forest Glen Park in Silver Spring is surrounded by Rock Creek Park. The walk includes the grounds of historic National Park Seminary. More information.